Perhaps it was the gluhwein kicking in, or my extra portion of bratwurst. Whatever it was, I found myself getting rather disoriented.at the Cologne Christmas Markets. Turning the corner another Christmas Market. Right then, hadn’t we already been to this one? I swear there in front of us was the potato kugel stall where I tasted a rather scrumptious fried potato and onion patty dipped in apple sauce? Then again, I certainly didn’t recall the long barbecued skewer of meats that were next door. What the heck, let’s just grab a few more Kugels and down more gluhwein anyway, I mean when in Rome as they say. 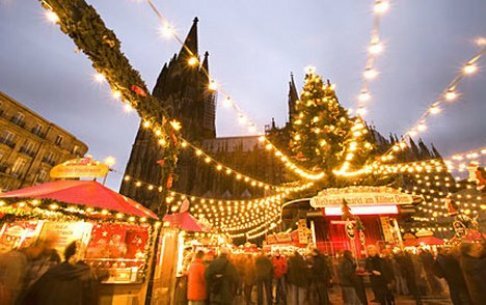 Cologne at Christmas is a rather special place. It’s dominated by the immense gothic cathedral in the centre of town, which was more or less the only thing left standing after WW2 after the allied pilots used it as a marker for their bombing raids. It took over 600 years to build and is a stunning piece of gothic architecture. The view from the top of its tower isn’t bad either. The city was flattened, and it’s a testimony to the people of Cologne who have raised it from the ashes and given it a new lease of life. How have they done this? Simply through ensuring that much of the rebuilding was undertaken with its past architecture firmly in mind, and making sure that its cultural roots are still front and centre. Cologne was the place where eau de cologne was created, (it was French for a time) and today the two oldest perfume houses Farina and 4711 are still going strong. But there are two major events that Cologners can categorically call their own. The annual Cologne carnival season which many people call the ‘fifth season’ takes place every November 11th at 11.11am and runs into the New Year up to Ash Wednesday, stopping briefly over the Christmas period. 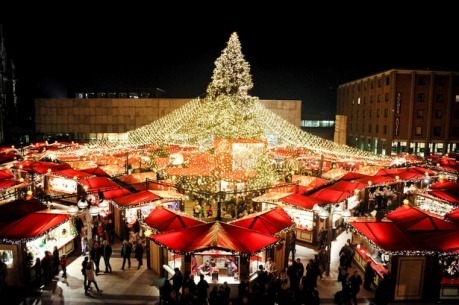 This rather segues well into Colognes second most famous event, the Christmas markets. There are, no less than six of them around the city, with the biggest one taking place in the main square next to the Cathedral. The cathedral’s backdrop does set the scene perfectly, after all, it is the very place where the three wise men (The Magi) are buried. In fact when you visit the nativity scene modeled out in the Cathedral’s vestibule you’ll notice everything is included except the three wise men because they are already there inside! 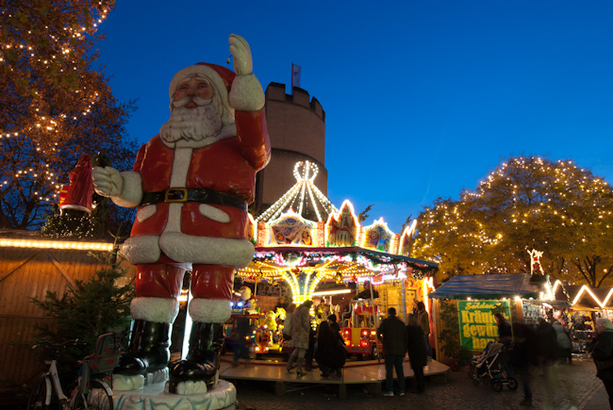 Anyway, that said, the markets are full of local traders offering everything from local crafts to plentiful portions of steaming gluhwein, perfect for the chill and of course to help you get through the visual bombardment on offer. The object of these markets is to provide you with plenty of opportunities for Christmas presents, and the opportunities certainly come thick and fast. There’s the biggest at Cologne Cathedral, the oldest at Angel’s Market at Neumarkt, just in front of the town hall you’ll find the Altermarkt great for kids with a an old fashioned children’s roundabout, puppet theatre, Santa Claus’ quarter and many toy stands, down by The Rhine near the chocolate museum you’ll find the Medieval Market, Rudolfplatz brings you the Fairy Tale Market and finally the floating Christmas market on board the “MS Wappen von Köln” nearby too. 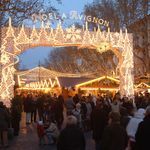 All the markets open at 11am and go on until 9pm. 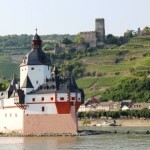 The Rhine Valley. Or should it be the Vine Valley?